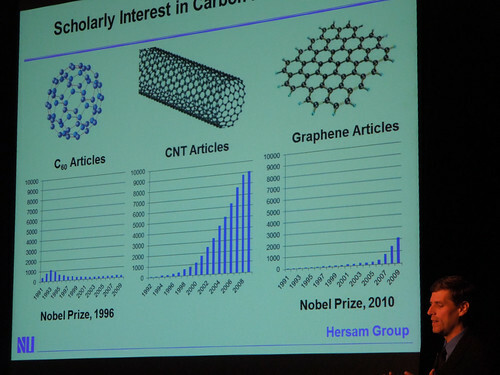 Dr. Mark Hersam posed this "age of carbon?" question as a broad brush heuristic, a way of contextualizing his payload of technical information regarding the work of his lab at Northwestern University. The hominids (two leggeds) have gone through stone, bronze, iron, plastic and silicon ages, maybe carbon is next or the one we're entering? This was a Friday evening, cool and rainy, at First Congregational Church. Recalling the first international conference on fullerenes, where I was present, rubbing elbows with Kroto and Smalley and maybe that shyer guy (did you ever wonder why academics have elbow patches on their blazers? -- the better for elbow rubbing)), the bottle-neck then was "the yield" as memorialized in Smalley's famous remark "it's the yield, stupid" piggy-backing on Bill Clinton's "it's the economy stupid" sound bite. Buckyballs (Bf, C60 etc.) were much more expensive than gold there for awhile, pound for pound, and much reward accrued to those labs which could supply them in any quantity. In the nanotube business the problem was much the same, not when it came to synthesis (for balls either -- strike a match and you'll get some) but sorting, teasing apart the some 300+ varieties that all have their specific conductivity, chirality, diameter... quite a hodge podge. Getting to interesting chemistry requires disentangling and for awhile that looked impossible. Not so, and this is where Dr. Harsam and his lab enter the picture, as pioneers of adding surfactants to give the nanotubes a way to dissolve in aqueous solution and then centrifuge the hell out of 'em. The tubes sort by neutral buoyancy within a density gradient. Big pharma has used this for a long time so equipment was ready off the shelf, and now the industrial correlate of Hersam's lab, founded by one of its grads, produces nanotubes in solution literally by the barrel. Graphene was the third breakthrough carbon to come along since the 1980s, with another Nobel Prize. Buckyballs were first in line, and I remember that chapter well, as I was in my hay day at CUE, laying the groundwork for a Project Renaissance (at least in Portland). I rented a convertible and took Dr. Nick as far as the Bay Area. I was on the phone with Applewhite and the BFI back then too, tasked with keeping Fuller's relevance to the fullerenes in the picture -- and that reminds me, I need to order another copy of Popko's book (Koski called during the talk -- I'll call him back today). [Later: I got it for "2nd kindle" aka the reader on the Mac Air, good for airports]. Then came nanotubes which I remember from Chalmers (Gothenberg, Sweden). Then graphene, which Glenn has been reading about (he sat to my left at the dinner). Was the Nobel Prize pre-mature? The science had been ingenious and skeptics had long held a mono-layer of carbon could not be stabilized. But would this be a "next big thing"? Samsung is forging ahead in this area. When it comes to nanotubes at least, the technology continues to be aqueous, meaning the electronics may be squirted out. These carbons are conductive, but variably. The ingredients are there, but will we evolve the complex structures characteristic of the silicon industry? During the Heathman dinner (entree salmon) I asked how many allotropes we were were talking about now. Isn't graphene just graphite pared down? But by that reasoning nanotubes are rolled graphite and buckyballs are balled graphite -- the SP2 hybrid bonds, making carbon 3-way with electrons in change is what's common to all but diamond, SP3 with 4-way valency. Tara joined us, helping with ushering people to their seats and sharing the dinner, then took off for a comedy club. She asked Dr. Hersam about mechanical photosynthesis which he agreed was the Holy Grail right now. Having sunlight directly power some CO2-to-methane chain was the focus of many a lab (Tara has a friend in that field). I then carpooled with Christine (another usher) back to the hood and she, Lindsey and I all watched American Psycho together at Blue House (Lindsey and I had not seen it whereas Christine had studied it professionally). Before the talk, I'd been snarfing down Starbucks and fumbling with my Amazon Kindle, plowing through Mary's Mosaic (recommended by SL). Along those lines, I found this New York Times headline, at the Starbucks, somewhat sadly & ironically humorous. Speaking of Applewhite and the naming of fullerene, I did hear back from Sir Harold Kroto after we sent him a group photo from near Mt. Hood Community College (MHCC). I've always thought he'd make a great ISEPP speaker and have said so many times to Terry. Skip Rung, head of ONAMI (Oregon nanotech) and our tour guide that time, introduced our speaker, after FEI, an electron microscope company, warmed up the audience with some of the best micrographs available from non-optical frequencies. These pictures are somewhat doctored (colorized) to bring out features. Look for the new IMAX movie this November. Nanotubes may be helping in the microscope business given their high sensitivity, especially in infra-red (so telescopy too maybe?). An incoming generation will need to pick up the torch and carry it. We all need to buckle down and learn our STEM subjects (or STEAM). Table conversation also ranged into Neal Stephenson's books. Jeff was getting into Cryptonomicon. I mentioned the exhibit at the science fiction museum in Seattle, the quill pen version of his Baroque Cycle. His name had come up earlier during Q&A, no coincidence given The Diamond Age with its nano-technology theme. I'm seeing more patterns in Harmony Korine films. One is what I'll call "closure" where the presence of the camera is explained, not left open. Trash Humpers goes furthest in this direction. It's the Blair Witch Project solution: the people in the film had one or more video cameras and were filming themselves. That's making more and more sense, whereas in the old days the camera's point of view needed no explaining. Donkey-boy on DVD is good because you get the special features, including an interview with the director himself. They played a lot with strapping cameras to the sides of peoples heads or elsewhere and sending them into scenes where the cameras were unseen. This has a Borat-like aspect in that some of the actors are real people who are clueless about being filmed. Candid Camera. However, we have less than complete closure in Donkey-boy. The camera may be anchored to a first person point of view, but not because they have a camera in the story, and not because the camera's viewpoint has to be explained. I only got it during the credits that the dad in this film is played by Werner Herzog. He and his voice seemed so familiar, but I wasn't prepared to find Harmony's favorite director starring in one of Harmony's own films. What a coup in a way, how fun for him. Thanks Werner, for a brilliant somewhat dead pan performance (not unlike his narrator voice). The DVD special feature also makes clear that Harmony was serious about presenting mental illness in an unvarnished, unsentimentalized vein. We are encouraged to have empathy for Julien, whom we follow most closely, but as the reviewer at IMDB points out, for all we know he's guilty of some rather large sins. The church, a mix of Irish Catholic and Black Evangelical, is, I think, portrayed in the story as clueless, e.g. the priest keeps trying to talk him out of the pursuing voices he hears as a consequence, suggests he go see a shrink. The shrink does not show up in the final cut, but is in one of the deleted scenes. The Julien character, brilliantly played, shows off more of what he can do. An uncle in the mental hospital gets some credit: Harmony insisted the actor spend some time with the role model for this character, the schizophrenic uncle. We get some cuts to the hospital in special features. This feels like Brad Pitt in 12 Monkeys and prepping for One Flew Over the Cuckoos Nest combined. Harmony is tossing his hat in that ring, the ring of those who do their own homework where mental illness is concerned. This movie was made after Gummo, but long before Trash Humpers and Spring Breakers. One of the patterns in a Harmony Korine film is that an apparent murder or perhaps negligent manslaughter goes by almost as a footnote, not as a major plot point and not as a crime to be solved. We're left to wander through these events, helpless spectators whose opinions and judgements may be of little relevance to the action. Was spotted by 'Harmony Korine' (qv) on a drug prevention episode of _"Sally Jessy Raphael" (1985)_ (qv) called "My Child Died From Sniffing Paint", and cast in his movie _Gummo (1997)_ (qv). I changed "her movie" to "his movie", pending acceptance of edit 130515-205327-871000 re Nick Sutton. I told my friend afterward that I wanted Sam, my late wife's brother, to see it, as he and Dawn grew up in Ohio and coped with poverty. You should know before starting this film that no cats were harmed in its making. Perhaps they used corpse kitties. They're actually not being drowned, shot or beaten to death on camera, much as it seems that way. It's a story, a couple of boys trying to make a living (and feed their glue sniffing habit) by hunting stray cats, and dealing with competition from another boy. The characters are shown following their own intuitions a lot, not being told what to do or think by others. Children spontaneously assume the demeanor and vocabulary of adults, as they pretend to shoot and kill a "fag rabbit" (another boy) and otherwise explore their world. They are self-actualizing, and in that sense high on Maslow's Pyramid, which may seem ironic given what appears to be dire poverty and need. But take a second look. They have plenty of clothes and time to just hang out and workout. Bicycles provide mobility. This is not crowded shanty town living. People enjoy big houses. This is our "land of the free". The boy we might call Gummo is Solomon in the movie, played by the talented Jacob Reynolds. His voice narrates on occasion, adding depth to his character and turning the movie into a kind of novelesque retrospective, a latter day Tom Sawyer, some midsummer night's dream (between tornadoes). The camera's eye moves smoothly through peoples lives, not noticed, or else it's stared at directly, someone the person knows, like a home movie. The intentional mix of film types and quality adds to the sense of watching amateur, home brewed stuff, an effective form of immersion. "Intoxicating" says one of the critics, of this widely acclaimed film. Harmony likes many of the same films I do, e.g. Badlands. I'm not surprised his films grab me the way they do (so far; I've seen two). Greek theater, why not start there, gave audiences a more god-like consciousness, just as movies do today, and novels. As an audience, you're treated to a form of omniscience none of the characters in the drama contemporaneously enjoys. You see what no one else sees, you see it all. Except in some plots you're left wanting for information. Whodunnits are like that. Indeed, novels or films in the first person can leave one in the dark in a more realistic manner than the "omniscient eye" of the all-knowing camera (a camera snooping in bedrooms, quite intimate -- what people would say the angels might see (Wings of Desire)). Where this goes is towards a sense in which god-like greater consciousness exists (starting in Greek theater), as we sometimes experience climbing a few ladder rungs ourselves (like through films) and posit the ladder stretching on before us. Surely there are higher and higher levels of appreciation for this vista, or... or what a waste, I guess? "At least there's higher than I've been" is a common conceit (an expression of humility and respect), suggesting a vector field towards greater pinnacles. When you point to "god like" as in "point of view" (a director's point of view), then you attract more believers to your Pin Head Church. Even hard-boned atheists might get on their knees here, asking for greater consciousness, a closer connection with God (their own neural net, their spaghetti monster). In his Tractatus, Wiitgenstein mentions a "top of the ladder" as if we got to the top. In Philosophical Investigations there's less of an end, as the need to invent (and retire) the partially overlapping language games goes on and on. The need to design and implement stuff doesn't just go away in a cloud. Work still needs doing. But there is that bit about being able to put it [philosophy] down occasionally, to end the obsession, to "get off the tractor" as it were (but then feel free to get back on again). How do "we" ("I" + "I") exist more than any "God" we believe in? Are you today the same mind as you were as a child, is your body the same? They say the child is father to the man (though that's sexist) so are you that man already, that woman you wondered if you'd be? The point is, you're not proved to exist yet either, no offense, evidence mounting you may not, so lets back off "existence" being what we most care about, just in case it's proven that we don't (really exist). We might praise God for His gracious manner of non-existence, a role model for how we might come to handle it, instead of with despair and sorrow.